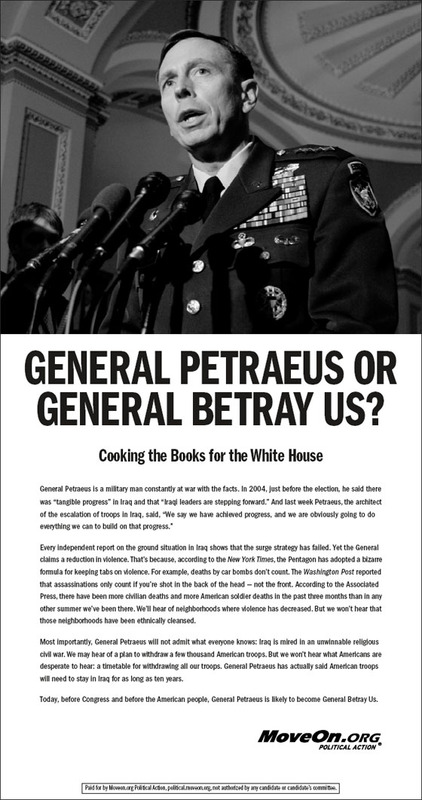 It sought out and utilized a comically disjointed picture of Gen. Petraeus in order to simultaneously smear him, and accent its claim that he is launching a PR campaign to "defend" the war in Afghanistan --- when in fact he could do no such thing without being under orders to do so. 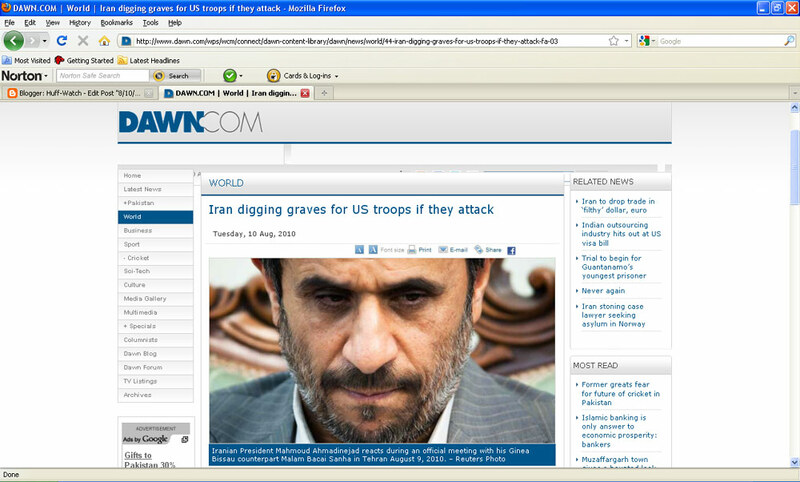 It continued its pathological shilling for Iranian madman Mahmoud Ahmadinejad, by seeking out and utilizing a comically complimentary picture of him, to accent a story about how he is building thousands of mass graves to bury U.S. soldiers, should they invade Iran. 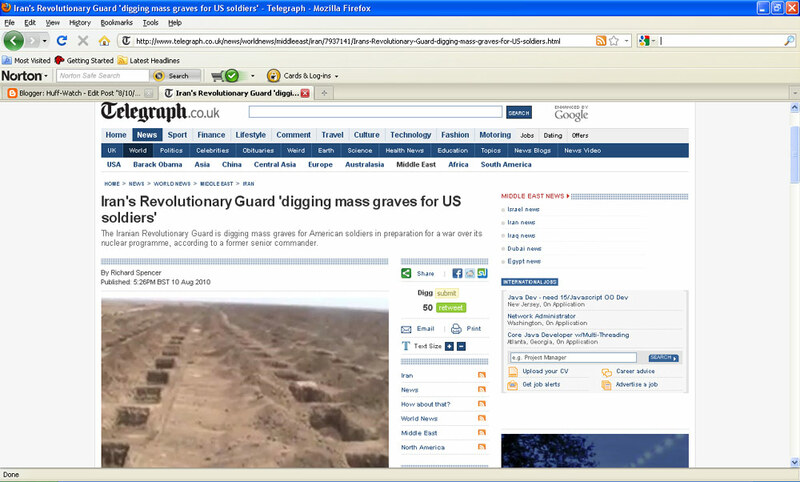 Comparisons are shown to how other (real) newspapers played the exact same story. 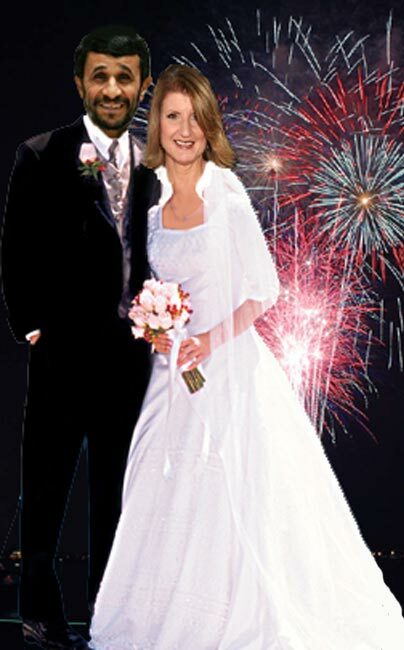 Together, these acts can have no other effect but to undermine the U.S. military and advance the cyber-jihad, while further endearing Arianna Huffington to Ahmadinejad. 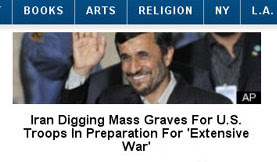 Let's analyze this headline, element by element. First, the picture. Could HuffPost have picked a more comical picture of Gen. Petraeus to use, to implicitly insult him in the context of the deadly-serious conflict in Afghanistan, which President Obama entrusts him to lead? But in a journalistic sense, this picture is far more than inappropriate. 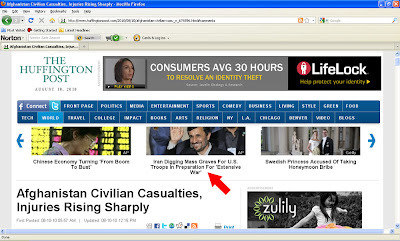 It mutters under its breath, "I'm Gen. Betrayus," a reference to the vicious, libelous ad by MoveOn.org that then-Senator Obama refused to condemn. It also snickers a remembrance to the libelous claims by then-Senators Clinton, Biden and Reid that Gen. Petraeus was lying to them, and to America, about the status of Iraq. Second, the word "blitzkreig." Most people today don't know or forgot the hellish, actual meaning of that term --- and of the many thousands of civilians who were slaughtered in "blitzkreigs." To associate that term with one of America's greatest generals of all time, whose leadership brought us victory in Iraq when it seemed defeat was assured, is an outrage. To use it in the context of Gen. Pertaeus's work, leading our soldiers in battle in Afghanistan against the Taliban and its allies --- who hide behind and murder civilians (including a pregnant woman) --- is doubly outrageous. Third, the sub-head: Gen. Petraeus is "launching media campaign to defend Afghan war," HuffPost? Really? What exactly is it that he is supposed to be "defending"? The fact that overwhelming majorities in the Congress voted in 2001 to authorize military action in Afghanistan? Or the fact that President Obama is fulfilling the promise he made for two years on the campaign trail, to escalate the war in Afghanistan, which he said must be fought and won? Gen. Petraeus had nothing --- zero --- to do with any of those decisions. Every one of them was made by our military's civilian leadership. 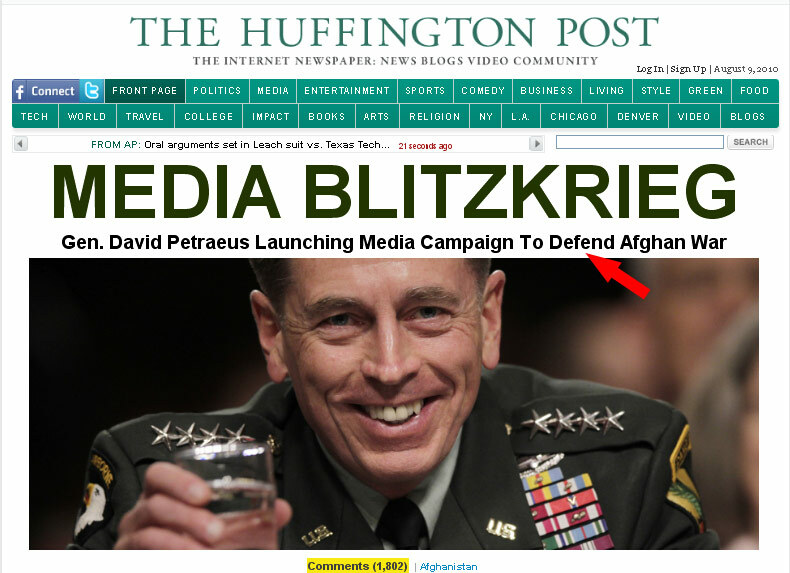 Insofar as the "media campaign" HuffPost alleges he is about to launch, the fact is that in the U.S. military command structure, neither Gen. Petraeus, nor any other military officer makes those decisions. Those decisions can only be made, once again, by our military's civilian leadership --- and in this context, that means President Obama, or his proxy, Defense Secretary Gates. The fact is that Gen. Petraeus did not, and could not, simply get up from his desk in Afghanistan and say, "You know, I think I'm going to blow off leading our soldiers in battle, and hop a jet to America, to go do some media appearances, to promote our work here." The only reason Gen. Petraeus is here, and is going to be doing any media appearances, HuffPost, is because either President Obama or Sec. Gates ordered him to do so. Period. 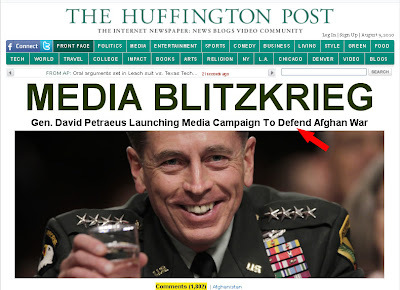 And if any one of HuffPost's crack team of 53 "editors" had ever served in the U.S. military, knows anyone who has, or even reached out to one, to do a little research for this article, they would have known that, and would not have concocted such a vicious smear against Gen. Petraeus. 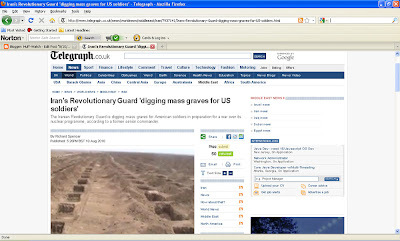 Is it a tragedy that the civilian toll in Afghanistan is "rising sharply"? Of course. 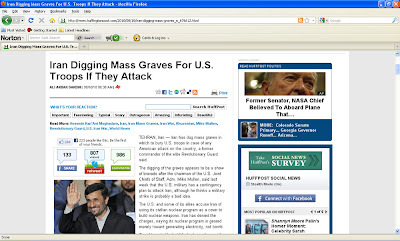 Is it the fault of the U.S. military, or Gen. Petraeus, who, in turn, is under orders of President Obama and Sec. Gates? No, except in the case of accidental deaths. We'll save that discussion for another day, though, because this screaming headline, and the story to which it led, played only a tangential role in HuffPost's advancement of the cyber-jihad today. 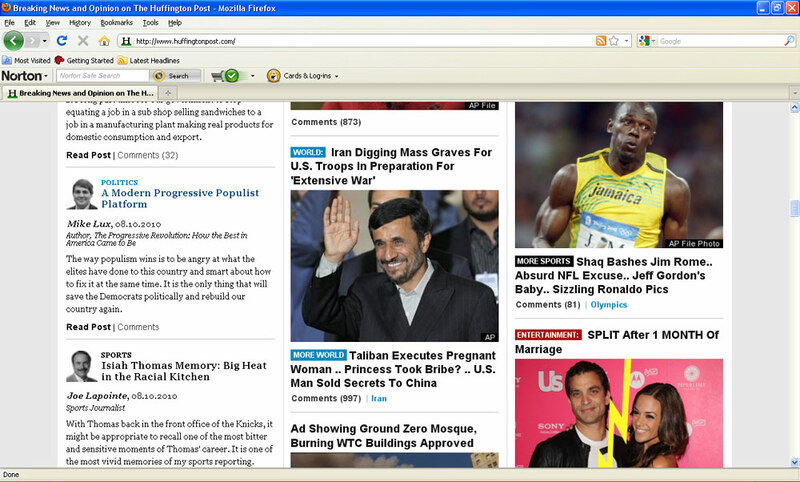 This is not an "accident" --- it is merely the latest example of how HuffPost pathologically decides to make Iranian madman Ahmadinejad look as fabulous, as benevolent, as loving and peaceful as possible --- as he says and threatens the most vile things imaginable (example 1, 2; more below). 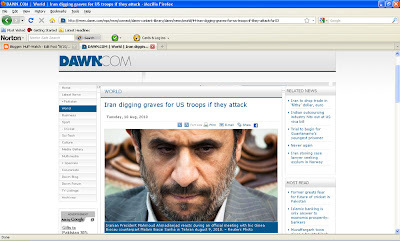 Here we have Ahmadinejad threatening to kill thousands of American soldiers --- and HuffPost chose a picture that makes him look like a grinning game show host. Wait a second, you may say, "How did other (real) news organizations play this story?" HuffPost is the #1 most-read blog in the world, a top-ten U.S. "news" website, and was recently named "the most powerful blog in the world" by The Guardian (UK). It has received preferential treatment in presidential press conferences, and has top members of Congress as official bloggers (article writers). It is also now a reportedly disgruntled member of the White House Correspondent's Association. 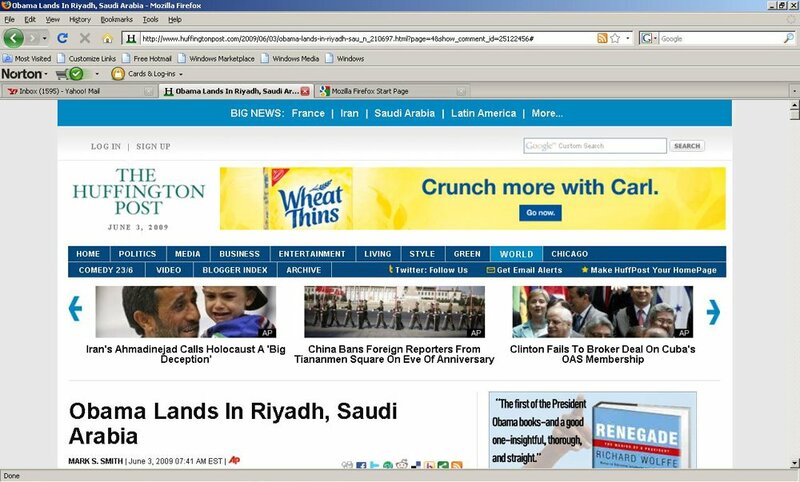 It has attracted advertising from many of the biggest corporations in the world. It should be noted that at a minimum, 135,000 of HuffPost's unique monthly visitors live in two of the nations most responsible for global Islamist terror: Iran and Pakistan (see Section 4-4.3 here). It is for this reason that HUFF-WATCH contends HuffPost's acts and omissions cannot help but advance the cyber-jihad, and undermine (if not subvert) the U.S. military. If you share our concerns about these issues, and would like to make your voice known to HuffPost's senior management (politely, please), here's how.